By tradition, this time of year is always very busy and this past month has been no exception. Hence no posting. Just thinking about what I have done in that time makes my head spin. With delight. And to spare you the dizziness of adding to your own busy times, I’ve just outlined a few things as an aid-memoir for me or for you to dip into if any of it takes your interest. 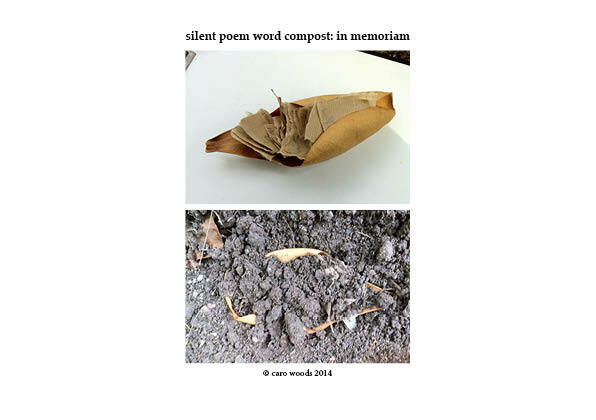 My response to the Slow Poem, Composted Thoughts Workshop led by Mat Osmond & Tom Scott at the Soil Culture Forum, Falmouth University. Layers of notes on one sheet of paper, torn up and placed in a dried magnolia leaf before being buried. The Soil Culture Forum – using the arts to revitalise a resource we take for granted. In brief, the presentations ranged from a captivating performance by Fraulein Brehms on the humble earth worm, Lumbricus Terrestris, to Yuli Somme, a felt maker from Devon who makes beautiful felt shrouds. The creative workshops were absorbing and the whole Forum was thought-provoking, not least the key-note presentation about the state of our soils by Patrick Holden, of the Sustainable Food Trust. (Note to self…must find out if I can get hold of a transcript of his presentation, it was so good). 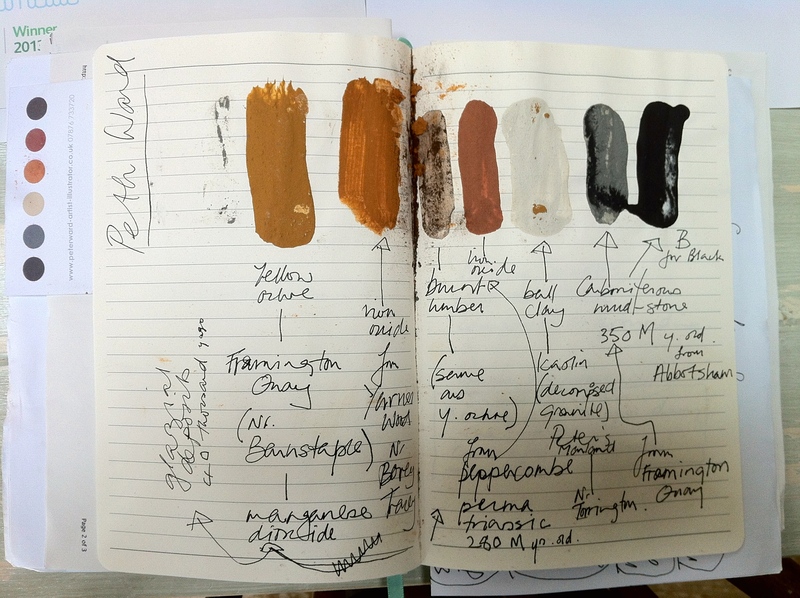 my notes showing the mud and water mixtures using earth pigments from Peter Ward‘s workshop . 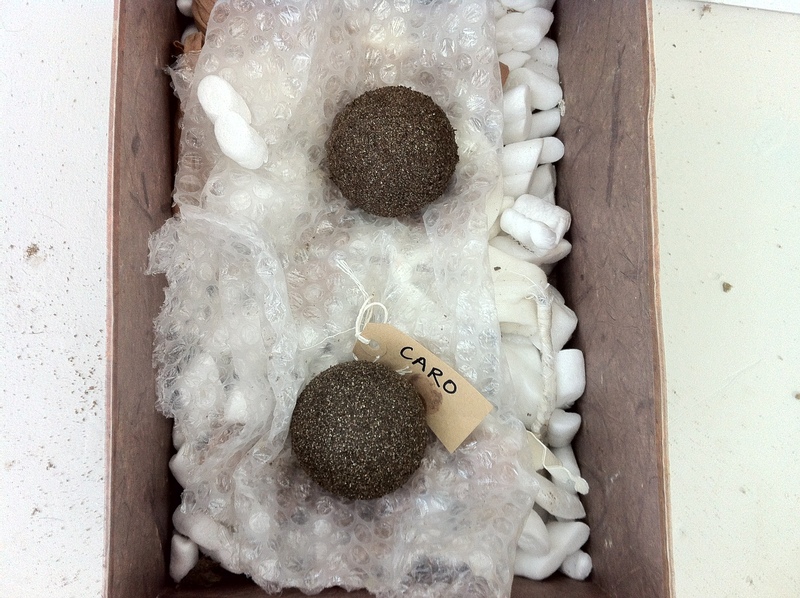 Making shiny mud balls on a Hikaru Dorodango workshop (the link describes the art of Japanese perfection), a workshop led by Emma Saffy Wilson. Also at Falmouth University was The All Makers Now ? Conference. A two-day conference exploring craft values in 21st century production. I was fortunate enough to be offered one of the 12 available places open to craft makers, museum curators, technicians and artists, on the 2 day workshop held at Autanomatic, the 3D Digital Production research cluster at Falmouth, just prior to the conference. 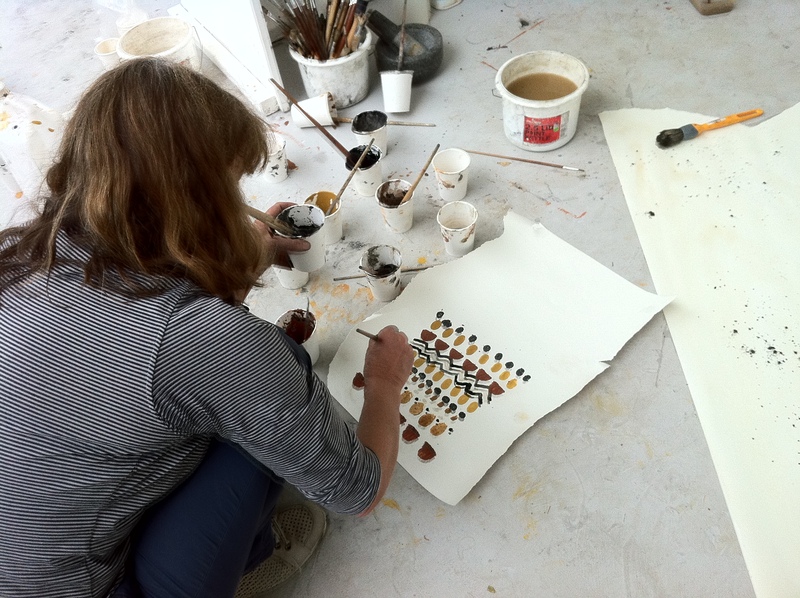 Each group of 4 people worked on an idea for an artwork to be included in the exhibition at Trelissick House, timed to coincide with the conference. With help from the skilled technicians, we had just two days in which to see our ideas go from the initial brain-storming session to material realisation in a finished artwork before our very eyes. We shaped and fashioned our way through the suite of cutting edge digital production technologies including Rapid Prototyping, Lazer Cutting, 3D Scanning and Computer-Numerically-Controlled Milling and Routing machines. The concept our group came up with was inspired by the famous Copeland China collection which was sold when the contents of Trelissick House were auctioned off. As the exhibition was being held in the now empty library, we decided that a book would be a suitable matrix to contain the now lost textures of remembered objects. A Bonhams lot ticket was the template on which areas of texture were either ‘imprinted’, embossed or ‘grown’, such as a section of a fire surround in the house, a small section of leaf pattern taken from a piece of china or a section of the topography of the river and the land sweeping up to the house. Even the wear marks on a piece of china, all telling some aspect of the story of Trelissick House and its famous garden. The whole process was extraordinary and every aspect new to me. The question we posed was: Can objects produced through the use of digital technologies (over the course of a two-day creative workshop), recapture the character of artefacts that have been displaced? A workshop delivered by Katrin and Shauna of MzTEK, a non-profit organisation with the aim of addressing the imbalance of women artists working in the fields of new media, computer arts and technology. 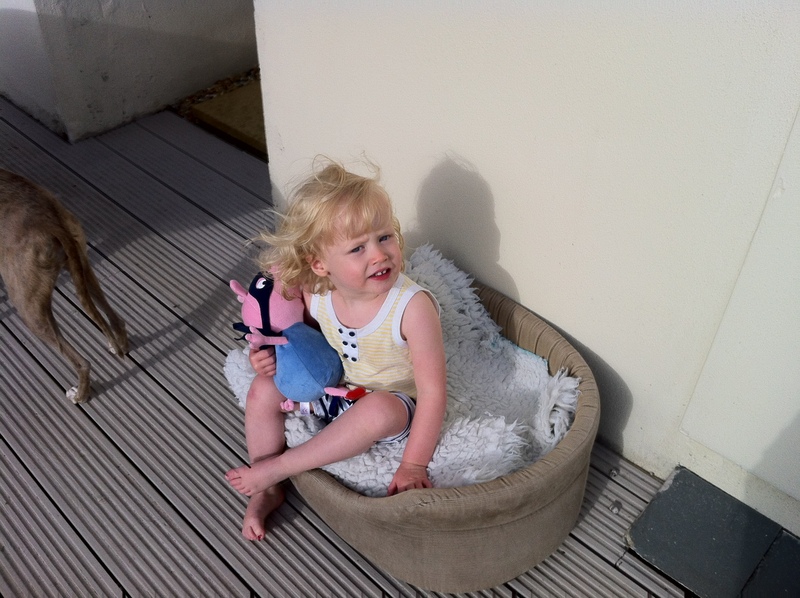 This workshop thanks to Creative Skills, Cornwall. The idea was to build our own wearable synthesiser by programming a small ‘lilypad’ computer to output movement data as sound using the freely downloaded Arduino software. Over the two days, some truly weird and wonderful inventions were created. Finally, I managed to combine a few days of family time with the search for my horse. 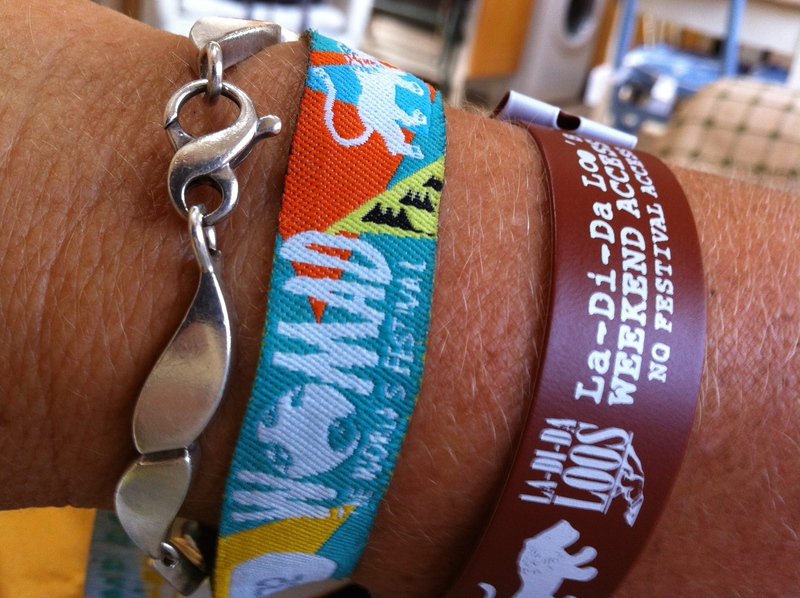 Plus an unexpected and last-minute invitation to spend the weekend at Womad thanks to someone who had dropped out of a party of friends because of ill-health. Wasn’t I just the lucky one? Three days immersed in a cauldron of melting heat, a rich array of costumes and heart thumping beats. A mass of chilled-out humanity soaking up all the colourful sights and sounds. I loved it. I also had use of the ‘posh’ loos. Luxury. So that’s me up to date. I’ve scarcely drawn breath and I’m off again tomorrow for the next 6 days with Richard Dealler (Mary / Michael Pilgrim Route) and crew walking over Bodmin Moor. The forecast is for rain but I’m a seasoned camper now. (She says brazenly but without conviction). The good news is, when I return, I will be welcoming my new horse, Tommy, to Trezelah. This is him being vetted on Monday. (see my blog pilgrimonhorseback.wordpress.com for more details of that). Exciting times.